Made from real flowers and botanicals, Nora Egger's unique floral syrups add color and flavor to drinks. Why should bees get all the nectar? Made from real flowers and botanicals, Nora Egger's all-natural, low-sugar flower syrups give humans a brand-new garden of flavors to mix into cocktails and tea. Crafted in very small batches, their intense sweet-and-citrus flavors and beautiful jewel-toned colors can be mixed into any beverageincluding waterfor all ages. 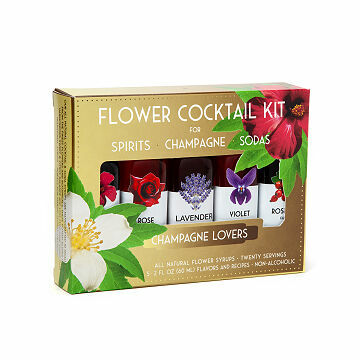 A beautiful complement for any dry or brut champagne or sparkling wine, the Floral Elixir Syrups for Champagne Lovers set includes hibiscus, lavender, rose, rose hip, and violet elixirs. The Tea Lovers set includes jasmine, lavender, lemon verbena, orange blossom, and rose elixirs to enhance unflavored black or green teas, whether hot or iced. Each set comes beautifully packaged with several recipes. Handmade in Ohio. Austrian-born Nora Egger has spent her life living between Europe and the US. While working in Europe, she traveled extensively and became fascinated by the role flowers and botanicals played in drink and food cultures. She started in her mother's kitchen, trying to create a recipe for a potent infusion of real flowers. Success led her to try more and more flavors, and the creation of her handmade line of Floral Elixir Syrups made from real flowers and botanicals. I enjoy experimenting with different cocktail/mocktail recipes and this set is a great way to add a flavor twist to an old classic or to try something totally new. This is the perfect gift to build upon! For Christmas I gave my friend the floral syrups, two champagne flutes and a bottle of champagne. The syrups look exactly as pictured and they look more expensive than they are. I am so satisfied with this purchase! I used this product as part of a prosecco bar. Everyone loved the flavors. Some flavors are very similar. Sister loved this product. All her friends wanted one for themselves. I got this for my friend, and she was so excited. She's planning drinks, tea, and all sorts of things she's wanted to make. I was thrilled to receive this kit for my cocktails. I'm sure they are delicious in champagne (as recommended) but I enjoyed them in vodka sodas! Just a perfect amount of floral without feeling like you are drinking soap. I will get again and gift in the future.